Zuma Beach may be Malibu’s most popular sand-centric destination. With its wide expanse of soft white sand and outstanding views of the luminous ocean at its edge, it’s served as the setting for countless films and television shows. But Zuma goes beyond simple aesthetics. In addition to easy parking and a playground, it also features picnic areas where families can enjoy lunch while gazing at the Pacific. Swim in the mild surf, go for a scenic hike, or watch dolphins and seals play—all at Zuma Beach. Located adjacent to the Point Dume Nature Preserve, Point Dume State Beach is much more than a place to swim and sunbathe. Bring your gear and enjoy some top-notch scuba diving or snorkeling, teach your kids how to windsurf or surf, or simply plan for a day of whale watching. Seeing these massive, majestic creatures in person is a thrilling experience for family members of just about any age. Accented by picturesque cliffs and rocks, Point Dume State Beach is an adventure not to be missed. Legacy Park boasts 15 acres of trails and lookouts as well as play areas enhanced by mosaic animal statues. Featuring primarily flat trails, it’s an ideal choice for an easy family hike that just happens to provide sweeping mountain views. Legacy Park also serves up ample educational opportunities related to the great outdoors thanks to its unique location at the confluence of four habitats: coastal prairies, bluffs, woodlands, and wetlands. In short, it’s a fun place for kids to play and learn. When you’re in the market for an outdoor experience that is more sprawling than most parks, Charmlee Wilderness Park delivers. Trails snake through this 532-acre expanse, serving up an array of short, simple hikes—as well as some longer alternatives—that lead to spectacular views of the water. A picnic area provides a place to take a break, have a snack, and enjoy the natural beauty all around, and a nature center presents educational insights into the wildlife species that call Charmlee home. 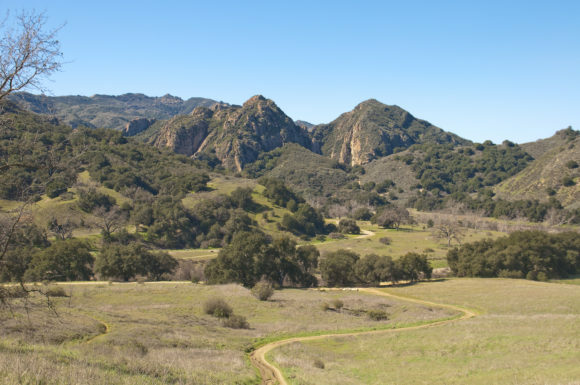 The 8,000 acres of Malibu Creek State Park include rolling plains accented by long grasses, oak tree savannahs, wildflowers, and peaks from which one can view the Santa Monica Mountains in all their glory. Sign up for a guided hike or set out to spot some of the diverse wildlife on your own. Either way, your family is sure to find this treasure trove of nature a memorable place to spend a day. Malibu Farm is a bright, vibrant, farm-to-table restaurant that serves incredibly fresh fare to satisfy children as well as adults. They raise their own chickens, grow their own vegetables, and only source sustainable seafood. With two casual yet elegant locations—one at each end of the Malibu Pier—and a kids’ menu, Malibu Farm strikes a nice balance between high-end establishment and family-friendly eatery. One would be hard pressed to find a restaurant with better scenery than legendary beachside favorite, Duke’s Malibu. Featuring an unbeatable location near Malibu Point, Duke’s serves up Hawaiian fare alongside umbrella drinks and other beverages in a welcoming seaside atmosphere. Whether you stop by for a weekend brunch, a weekday lunch, or a family dinner out, you’ll find the menu extensive and intriguing. The colorful kids’ menu promises standards such as sliders as well as creative options like coconut shrimp with guava cocktail sauce or macadamia panko-crusted island fish. For the grown-ups, choices range from vegetarian dishes to a variety of steaks as well as, of course, seafood. If you’re in the market to buy or rent a home in the Malibu area, be sure to visit http://www.christiesrealestate.com/. The premier high-end real estate specialists in the region, Christie’s International Real Estate will be sure to find the ideal property to serve as your second home. The view from Point Dume is amazing. I’ve eaten at Duke’s before and you are right about it being a beautiful place to dine. Point Dume was one of my favorite places to stop and admire the ocean views. I would love to have food with such a great view at Duke’s Malibu. All your pictures are amazing. Have pinned your post! The ocean views at Duke’s can’t be beat, plus the food is very good there too. Looks like a great mix of things to do and see! Nice pics. Thanks Julian! Malibu has a lot to offer other than its beaches. OMG, my husband was born and raised in Malibu! This is such a blast from the past. Did you know that the photo you have at Malibu Creek State Park is where they filmed the original TV series Mash? And Duke’s is where the real life “Gidget” still comes in to talk with patrons. She’s over 70 and still surfs! Yes, I knew about the movie Mash being filmed there, but I was unaware that the real life Gidget still surfs and goes to Duke’s. Malibu Farm would be my favourite for sure. It would also be interesting to go to Duke’s now that I have been to Dukes at Waikiki. Beautiful spots all of them. I’m sure that Dukes in Waikiki is very familiar. We really enjoyed eating and watching the waves crushing next to us. We will definitely be visit Malibu one day, it look like an amazing place with a great variety of things to see and do! Paul recently posted…Hiking Smarna Gora, The Local Ljubljana mountain! I always pictured the houses on Malibu beach with the spectacular views of the ocean, and wondered what it would be like to visit. I was surprised by all the activities the city has to offer. Malibu Farm or Duke’s! We are driving down the US West Coast in October!!! I hope you get a chance to stop at either of the two places. The food was very good. Not very trip is for everyone. What glorious beaches! I’ve never been to Malibu, but I’d love to go. I’ve been a few times. I mostly enjoy dining by the ocean and the views. OMG that last picture, sipping wine while the waves crash over the rocks outside your window. HEAVEN!!! It’s an amazing view and very relaxing. Wow; did not know that there is so much outdoor stuff to do in this area – the national parks all look amazing. I was as surprised to learn about all these areas too. The first time I heard of Malibu is from that song by Hole. I loved that song and it looks like I’m gonna love the place itself, based from your pictures it looks fantastic. I have driven through Malibu many times, but have never taken the time to actually explore. Duke’s looks amazing. Duke’s is such a great spot to eat or enjoy a cocktail! It’s really beautiful place to go! The pictures are so beautiful! Yes, I just love Malibu!